I found this weathered grey wood mesh rack thingy on my trip to Arizona this summer. I thought it would make a nice stage for a changing tabletop display. This time it corrals a still life in the sitting room. I've also gathered up some recent finds for an interesting look. This length of crochet shelf edging was exciting to find. Love anything with a bird motif! The indispensable magnifying glass nearby. And the merest hint of fall. Still space left for some "necessary" things. . . . I hope it's turning into a nice week for you! And hope you have something cheery going on too. . . . If I had more presence of mind I might have posted this space for the Where Bloggers Create party. It is certainly the place where a heck of a lot of Cabin & Cottage stuff happens! And it is the very first room I ever posted about, here, in a post called THE NURSERY, in the spring of 2010 when I became a blogger. . . . Even though it's not a nursery anymore, not a lot has changed. You may already know that I love linens and that I do a lot of ironing. I prefer leaving up the ironing board even when I need a guest room. It's usually just my grandgirls, so I toss something pretty over to make it more functional. The room is our happy place! Bright and sunny and full of fun things. Even when the girls depart I leave the ironing board covers on for as long as I can, just pulling them back a bit when I need to iron. An ironing board makes a good work surface at a standing height. Handy for this vintage lamp shade I'm working on. And with great light in front of the window there's no need for the lamp! Today I ironed this sweet vintage apron. I love that pink rose print on yellow fabric. Don't you love the rick-rack? Somebody was muscling in on my territory when I nabbed this at a fleamarket. Who knows what else I might have found, because I ceded the field. It doesn't make sense to me to scrabble over piles of cheap stuff in a few square feet of space, even if were the first one there! ! ! Apron back view. . . . I'm sure that people have good lives even without the vintage textiles. Just don't ask me how. This little lady will probably just hang here for awhile because it cheers me up so. It also gives me the chance to show you the cool set of vintage wood hangers that I found at Lonesome Dove Antiques at the Grand Canyon a while ago! Nice and round, and with fabulous patina. . . . The most recent doily intake. . . .
An enormous vintage net lace tablecloth in unused condition. . . . Pretty china. . . . It all needs a soft place to land while I figure things out. So back to business. . .
Gotta get back to those junk piles! Still lots of weekend left. As much as I enjoy pretty prints, I am also drawn to the classic look of an all white bed. I would love a supply of European linen sheets in white. Preferably vintage. 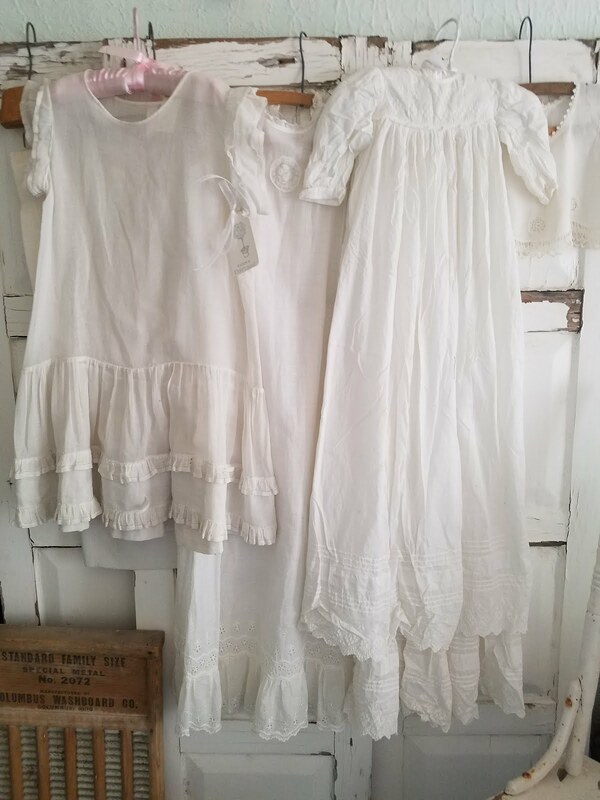 I know I can find them online, but until that happens I will dress my plain cotton sheets up with lacey vintage pillow slips. I already bought a couple of puffy oversize bed pillows to accommodate some of my nicer vintage pillowcases that are a bit on the large size. Antique and vintage bed linen does not come in a standard size. A bedroom chair is a handy spot where extra pillows get tossed at night. Another large pillowcase with a tatted edge peeks out underneath. Though both are vintage, the fabric is almost like new, having most likely been safely tucked away for a time. The pillowcase on the left has the opposite problem. It requires a pillow a little more narrow than standard. As is often the case, this pillow slip is one of a kind. But mixed white bed linens look wonderful together. And the individual character of hand worked linen makes it worth a little extra trouble. Still lots of dreamy soft nights left this summer! Wishing you a dreamy white Wednesday!